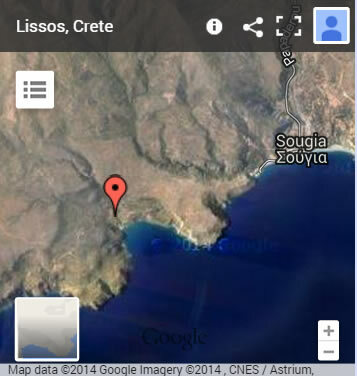 The archaeological site of Lissos is located on the South coast of western Crete, in the bay just west from Sougia. Lissos was an important city of Crete dating between the 4th century BC until the 7th to 9th century AD, when abandoned after its destruction by a powerful earthquake that struck the island. The period of its acne, during the Hellenistic Times (330-69 BC) and until the 5th century AD, was a worship center to the goddess Diktinna. The temple has not been discovered yet, but there are findings in Lissos proving its existence. Read about the history of Lissos. See what is preserved in the archaeological site of Lissos, as described by the Greek archaeologists. In Hellenistic times, the water of lissos considered thermal (it flows yet), and was the reason to be built here a healing temple which acquired great fame and people flocked to be cured, coming even beyond the Greek territory. The temple of Asclepius was excavated in 1957-1960 under huge rocks that had crushes, bringing to light rich discoveries of the Hellenistic Times, among them, votive offerings with inscriptions, devoted to the God of health, Asclepius. Today in Lissos, on the temple of Asklepius, the mosaic floor which was added to the Roman period (69 BC - 330 AD) is partially preserved, and around it are scattered various architectural remains of the temple. Watch a couple of videos taken at this point. Most of the ruins in Lissos belong to the Roman period. Some are visible, such as the vaulted tombs of the Roman necropolis located to the western side of Lissos, while others have not yet been excavated, such as the Roman theater. There are two chapels in Lissos that belong to the Byzantine period. Both are built on the ruins of early Christian churches. The chapel of Agios Kyrikos is located near the Roman theater, and the chapel dedicated to Virgin Mary is located close to the beach of Lissos. It is evident that during the construction of the chapel of the Virgin Mary, were used architectural remains of the ancient edifices of Lissos. View video footage of the archaeological site of Lissos. The easiest way to get to Lissos is by water taxi from Sougia or Paleochora.